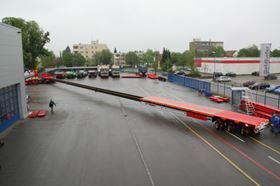 The Godlhofer trailer can transport wind turbine blades up to 62 m in length. The trailer’s three rows of pendular axles give a steering angle of 60°, and its hydraulic suspension has an axle stroke of 600 mm, meaning any stress is taken off the blade during off-road transportation. The Goldhofer SPZ-P 3AAA is designed to carry wind turbine blades in their shipping frames, and has the capacity to extend from 20 to 62 m.
Its deep extendable spine can take a 13 tonnes load 10 m from the front, which is where the frame’s front bolster supports the wind turbine blade. The rear bolster can be transported at the extreme rear of the trailer, with the blade extending 10 m behind it. According to Goldhofer, this increases manoeuvrability and reduces trailer length to 52 m.
It has a gross weight of 62 tonnes and a payload of 38.3 tonnes, with a deck height of 1 m when laden. 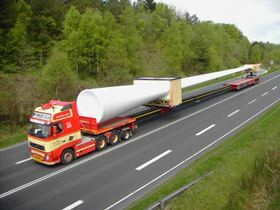 Transportation of wind turbine blades on the trailer complies fully with all Vestas transport requirements.